and help them succeed in school and life! 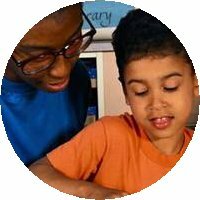 Be a reading tutor and help kids in your community succeed with reading! The Foundation has received federal funds to significantly improve children’s reading ability. Funding supports professional development, book distribution, community events, and tutoring. The Three Rivers Education Foundation collaborates with regional education centers, school districts, and community organizations to make reading improvements a reality.